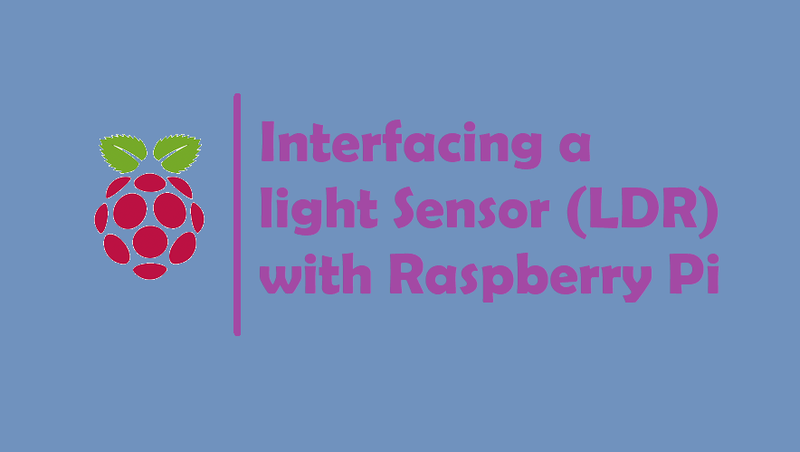 In this tutorial we learn how to Interface a light Sensor (LDR) with Raspberry Pi and turning an LED on/off based on the ligh-level sensed. Look given image, Connect one side of LDR to 3.3V and other side to a1μF capacitor and also to a GPIO pin (pin 18 in this example). An LED is connected to pin 18 which is controlled based on the light-level sensed. The readLDR() function returns a count which is proportional to the light level. In this function the LDR pin is set to output and low and then to input. At this point the capacitor starts charging through the resistor (and a counter is started) until the input pin reads high (this happens when capacitor voltage becomes greater than 1.4V). The counter is stopped when the input reads high. The final count is proportional to the light level as greater the amount of light, smaller is the LDR resistance and greater is the time taken to charge the capacitor. I hope you like this example tutorial Interfacing a light Sensor (LDR) with Raspberry Pi.